Pro Stock driver Chris McGaha plans to contest the entire 24-race NHRA season in 2014 after acquiring the complete racing inventory of 2009 World Champion Mike Edwards. The deal that apparently has sent Edwards into an unexpected retirement at age 56 was announced by McGaha via emailed news release from his hometown of Odessa, Texas, on Tuesday. Edwards, of Coweta, Okla., finished fourth in the 2013 NHRA Mello Yello Drag Racing Series point standings after the six-race Countdown to the Championship with 2,482 points – 90 markers/four-plus rounds of racing behind five-time/reigning World Champion Jeg Coughlin Jr.
Edwards – who also finished behind former World Champions Allen Johnson and Jason Line in the final standings – revealed during the annual Chevrolet Performance U.S. Nationals near Indianapolis in early September that he had been competing with a torn rotator cuff in his left shoulder. Edwards confirmed then the injury would require surgery he purposely delayed until season’s end. Despite that ailment, Edwards compiled a class-leading six wins highlighted by back-to-back victories heading into the Countdown. He was runnerup at two national events and dominated qualifying with poles in 15 of 24 races. Edwards’ final won/loss record in his Interstate Batteries/I Am Second Chevrolet Camaro was 46-18. Based upon 80 runs, Edwards’ average elapsed time for the quarter-mile was a class-leading 6.579-seconds at a class-leading average 210.51 mph. Edwards, who made his Pro Stock debut at the 1982 season-opening Winternationals, was named NHRA co-Rookie of the Year with Pro Stock Motorcycle rider Matt Hines in 1996. McGaha, who finished 17th among 37 drivers earning Pro Stock points last season, plans to run the 2014 schedule in the renamed Harlow Sammons/Southwest Performance & Machine Camaro. A former Competition Eliminator racer, McGaha graduated to Pro Stock in 2011 and is looking for his first class win. His best performance to-date has been a semifinal finish at the NHRA Gatornationals in Gainesville, Fla., during his rookie season in 2012. McGaha’s career best ET is 6.515-seconds at 212.59 mph. “Our plan for next season is the same as it was this year; we plan to race all 24 events and if we can stay in the top-10, then we’ll keep going,” said McGaha, who selectively will race the tour if he falls out of the top-10. Nominated for the Automobile Club of Southern California Road to the Future award in 2012, McGaha made his NHRA Pro Stock debut at the 2011 U.S. Nationals and qualified No. 11. He also qualified No. 15 for the AAA Fall Nationals at the Texas Motorplex in Ennis, where he earned his first round win. McGaha, a machinist and vice president of Southwest Performance & Machine, said his negotiations with Edwards ramped-up at season’s end. In the transaction, McGaha acquired the 2013 Camaro that Edwards qualified in the top half of all 24 events and led the point standings for 16 races. In addition to the Camaro, McGaha also purchased Edwards’ truck and trailer and the contents of his engine shop in North Carolina, including all engines, transmissions, rear ends and components. However, McGaha could not convince Edwards _ winner of 48 combined national events in NHRA’s Sportsman and Professional categories _ to join his expanded team. “Believe me, I asked Mike if he would be my crew chief,” McGaha said. “We tried our hardest, but he wouldn’t do it. He was really nice about it and his exact words to me were, ‘If you want to go testing, just call me.’ But no, he isn’t going to be my crew chief.” The 1981 NHRA Modified champion, Edwards served as crew chief for David Nickens from 1989-91. McGaha continues to recruit crew members and a potential crew chief before debuting the car at the season-opening 54th annual NHRA Winternationals at Auto Club Raceway in Pomona, Calif., Feb. 6-9. Ironically, McGaha ousted Edwards _ driving the Camaro for the first time _ during last year’s Winternationals. Mike hope you heal well & THINK about making a return. Will be great it that happens. My best wishes to a tremendous racer like Mike Edwards. I loved to see him compete at the races, I normally attend 2 NHRA races during the season, which are in Houston and Dallas. I’m from Corpus Christi, Tx. I’m sure Mr. Edwards, has his own reason for early retirement, NHRA competitors can rest a little this season, because a LION will be at rest, and out of the public to view, and other racers to fear. But hey there is still another Chevrolet racer coming on again, I’m sure glad he’s returning. So again hats off to Mike Edwards, best wishes to him, and hope U heal quick and get ur self back to doing things u need and like to do. Wow this is sure shocking to me. Thank you for your example of giving back to people and children,and investing yourself in what’s the 1st most important things in life, with racing a strong 2nd or 3rd. You are an inspiration to me and many others. You are and will be blessed in whatever you set your hand to. I could tell the last couple of races Mike Edwards was down. Having one of the fastest qualified cars out there and losing in early rounds. There may be other factors I am not aware with his decesion as well. I don’t know the man personally but I can tell you couldn’t find a better person from everything I have seen and heard. I hope maybe once his surgery heals he will decide he wants to come back to racing. If not I only wish him the best in whatever he choses to do. God Bless one of God’ best men! GOD Bless you Mr. Edwards, It was a pleasure to watch you race. A true gentleman and racer. Pro Stock will not be the same without you! 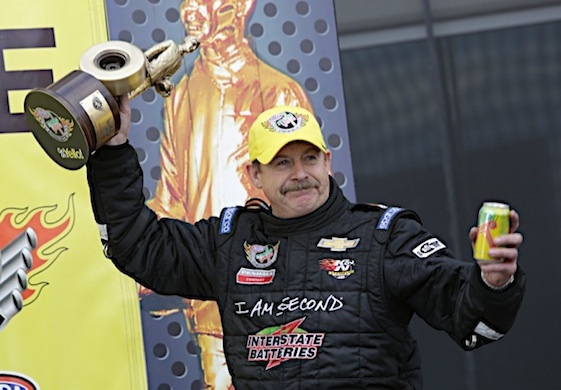 What a shame.NHRA & fans or not will surely miss one of the best pro stock racers on the circuit. What a christian gentleman and such a class act. Heres wishing Mike the best in whatever he does from here. Lots of class acts in N.H.R.A. Pro Stock – but I vote for Mike Edwards at the top of the list – and I’ve been watching drag racing for 50 years! Since my local track opened – the stunning Bruton Smith zMax Dragway in Concord NC – Edwards has shown up, always run like greased lighting … and I never once saw him refuse an autograph, a hand-shake or fail to smile and treat fans with professional courtesy – plus. Mike Edwards, you are truly one-of-a-kind; a warrior behind the wheel, a fine Christian with your faith leading your life. Best of luck in the future. You will be missed by everyone in the sport, fan or foe. Mike Edwards is first of all a man of GOD and his path in life has already been choosen. I pray him well as he shift gears on the next road of life, on quarter of a mile at a time.